Sterling Silver 1 Ct TDW Diamond Drop Dangle Leverback Earrings These exquisite dangle earrings from the Amour Collection feature round white diamonds. 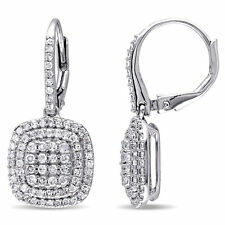 This dazzling pair is set in sterling silver and are secured with leverbacks. 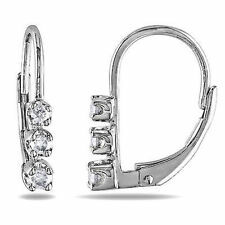 Sterling Silver 1/4 Ct TDW Diamond Drop Dangle Leverback Earrings H-I I3 These glistening dangle earrings from the Amour Collection feature round white diamonds. This graceful pair is set in sterling silver and are secured with leverbacks. Clarity: I3. Style: Dangle. Diamond weight: 1/5 carat. Its quite simple really. We are involved in almost every aspect of the jewelry creation process. By constantly traveling the globe to find the best prices on Diamonds, Pearls and Gemstones, we manufacture for less. 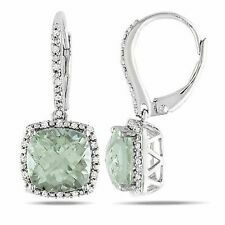 Sterling SilDrop ver 1/4 Ct TDW Diamond Dangle Leverback Earrings H-I I2-I3 These wonderful dangle earrings from the Amour Collection feature round white diamonds. This marvelous pair is set in sterling silver and are secured with leverbacks. Category Type:Diamond Dangle Earring. Diamond Carat Weight. Combined diamond weight of 1/4 carats total weight represents a range of 0.23 - 0.28 cts. Diamond Clarity / Color. 10kt Yellow Gold. We import these products from a certified factory, allowing us to pass the savings on to you. Category Type:Diamond Dangle Earring. Diamond Clarity / Color. Diamond Carat Weight. Combined diamond weight of 1/3 carats total weight represents a range of 0.30 - 0.36 cts. 14kt White Gold. Gold Purity & Color. Oval drop earrings present two small 1.3 diamonds set in a rose gold flashed sterling silver filigree design. The earrings feature leverback closures. Clarity: I3. Color: J-K. You must complete your order using the CheckOut process. Category Type:Diamond Dangle Earring. Our huge collection of products includes rings, fashion and wedding bands, bridal jewelry, pendants, gems and much more! Combined diamond weight of 1/20 carats total weight represents a range of 0.04 - 0.06 cts. The 4 Round Diamonds (Color;GH, Clarity;I3) are beautifully shared prong set in the inversed cone of the White Silver Lily. Its quite simple really. We are involved in almost every aspect of the jewelry creation process. Category Type:Diamond Dangle Earring. Diamond Clarity / Color. Diamond Carat Weight. Combined diamond weight of 1/3 carats total weight represents a range of 0.30 - 0.36 cts. 10kt Yellow Gold. Gold Purity & Color. Category Type:Diamond Dangle Earring. Combined diamond weight of 1/20 carats total weight represents a range of 0.04 - 0.06 cts. Diamond Clarity / Color. Diamond Carat Weight. 10kt White Gold. We import these products from a certified factory, allowing us to pass the savings on to you. Certified by the SGL ,graded I3, there are 46 baguette fierydiamonds here in these "circle of life" style drop earrings. These are beautiful classic ,elegant sparkling white gold drop diamond earrings. 1/4 TCW Enhanced Blue and White Diamond Floral Motif Drop Earrings in Platinum over Sterling Silver. White diamond accents give them gorgeous contrast and extra sparkle. Graced with 1/4 carat T.W. of diamonds, these beauties have a secure lever backs. Category Type:Diamond Dangle Earring. Diamond Clarity / Color. Diamond Carat Weight. Combined diamond weight of 1/3 carats total weight represents a range of 0.30 - 0.36 cts. 10kt White Gold. Gold Purity & Color. 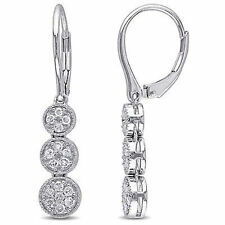 Oval drop earrings present two small 1.3 diamonds set in a sterling silver filigree design. The earrings feature leverback closures. If the item you receive is not as described you get your money back. Sterling Silver, 925 parts per 1000. Diamond Color Sterling Silver. Main Stone Shape Diamond Carat Weight. Diamond Clarity / Color. GND-92274 Combined diamond weight of 1/5 carats total weight represents a range of 0.18 - 0.22 cts. Category Type:Diamond Dangle Earring. Diamond Clarity / Color. Combined diamond weight of 1/4 carats total weight represents a range of 0.23 - 0.28 cts. Diamond Carat Weight. 10kt White Gold. We import these products from a certified factory, allowing us to pass the savings on to you. Category Type:Diamond Dangle Earring. Our huge collection of products includes rings, fashion and wedding bands, bridal jewelry, pendants, gems and much more! Diamond Clarity / Color. Combined diamond weight of 1/3 carats total weight represents a range of 0.30 - 0.36 cts. Category Type:Diamond Dangle Earring. Combined diamond weight of 1/20 carats total weight represents a range of 0.04 - 0.06 cts. Diamond Clarity / Color. Diamond Carat Weight. We import these products from a certified factory, allowing us to pass the savings on to you. These attractive earrings feature 24 pave-set black diamonds in a black & white rectangle design. They are secured by leverback backings. Total diamond weight. 25ct. You must complete your order using the CheckOut process. Category Type:Diamond Dangle Earring. Combined diamond weight of 1/3 carats total weight represents a range of 0.30 - 0.36 cts. Diamond Carat Weight. Diamond Clarity / Color. 10kt White Gold. We import these products from a certified factory, allowing us to pass the savings on to you. Category Type:Diamond Dangle Earring. Combined diamond weight of 1/2 carats total weight represents a range of 0.46 - 0.57 cts. Diamond Carat Weight. Diamond Clarity / Color. 10kt White Gold. We import these products from a certified factory, allowing us to pass the savings on to you. These attractive earrings feature 50 pave-set diamonds in an oval filigree design. They are secured by leverback backings. Total diamond weight. 5ct. If the item you receive is not as described you get your money back. 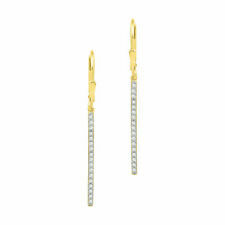 Category Type:Diamond Dangle Earring. Sterling Silver. Combined diamond weight of 1/5 carats total weight represents a range of 0.18 - 0.22 cts. Diamond Clarity / Color. Diamond Carat Weight. Our huge collection of products includes rings, fashion and wedding bands, bridal jewelry, pendants, gems and much more! 10kt White Gold. Category Type:Diamond Dangle Earring. Diamond Clarity / Color. Combined diamond weight of 1/5 carats total weight represents a range of 0.18 - 0.22 cts. Diamond Carat Weight. We import these products from a certified factory, allowing us to pass the savings on to you. Category Type:Diamond Dangle Earring. Combined diamond weight of 1/4 carats total weight represents a range of 0.23 - 0.28 cts. Diamond Clarity / Color. Diamond Carat Weight. 10kt Yellow Gold. We import these products from a certified factory, allowing us to pass the savings on to you. Category Type:Diamond Dangle Earring. Combined diamond weight of 1/2 carats total weight represents a range of 0.46 - 0.57 cts. Diamond Carat Weight. Diamond Clarity / Color. 10kt Yellow Gold. We import these products from a certified factory, allowing us to pass the savings on to you. Category Type:Diamond Dangle Earring. Sterling Silver. Diamond Clarity / Color. Combined diamond weight of 1/5 carats total weight represents a range of 0.18 - 0.22 cts. Diamond Carat Weight. We import these products from a certified factory, allowing us to pass the savings on to you. 10kt White Gold. Category Type:Diamond Dangle Earring. †Combined diamond weight of 1/4 carats total weight represents a range of 0.23 - 0.29 cts. Diamond Carat Weight. Diamond Clarity / Color. We import these products from a certified factory, allowing us to pass the savings on to you. 10kt Rose Gold. Category Type:Diamond Dangle Earring. Diamond Clarity / Color. Combined diamond weight of 1/5 carats total weight represents a range of 0.18 - 0.22 cts. Diamond Carat Weight. We import these products from a certified factory, allowing us to pass the savings on to you.